• A feature in this blog’s Books section containing the Introduction, Acknowledgments, and Table of Contents for my publication Manila by Night: A Queer Film Classic (Vancouver: Arsenal Pulp Press, 2017). • Order information (from the publisher) for Manila by Night: A Queer Film Classic (2017), the first Filipino movie to be featured in Arsenal Pulp Press’s well-received film monograph series. • “Statement on the Availability of Filipino Films during the Internet Era,” written in defense of the uploading of the film copy in the wake of a so-far unresolved conflict between producer and remastering outfit. • Folio within a folio: “A Closer Look at Manila by Night,” the first anthology devoted to a single Filipino film, in the August 2012 issue of Ateneo de Manila University’s Kritika Kultura. • “Queerness as Defiance in Manila by Night” is the lecture I delivered (on Manila by Night: A Queer Film Classic) during the launch of Angela Stuart-Santiago’s project Pro Bernal, Anti Bio on August 7, 2018, at the Cultural Center of the Philippines. • Ishmael Bernal’s full script of the film, with an English translation by Alfred A. Yuson, published in the literary section of the aforelisted Kritika Kultura issue. • The PDF of an earlier transcription of the film, published right after the film ban was lifted by the Board of Censors for Motion Pictures but with the text suffering an inordinate number of cuts, including the title changed to City after Dark. • A detailed storyline, originally drafted for the monograph I wrote for Arsenal Pulp Press’s Queer Films Series. • The last interview with Ishmael Bernal, conducted by Aruna Vasudev and published in 1995 in Cinemaya, the magazine she edited. 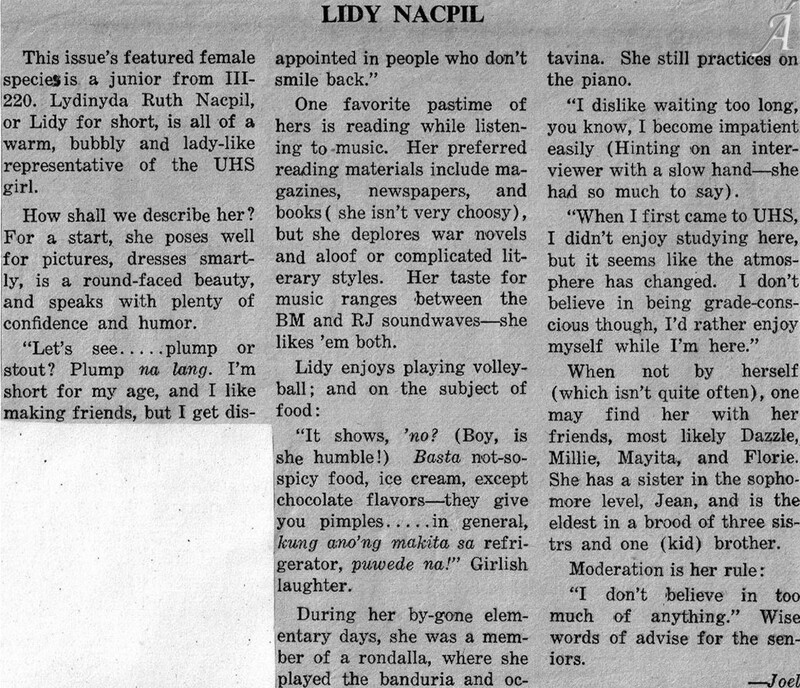 Unfortunately published without any apparent fact-checking; subject, interviewer, and journal are all gone. • “Manay Revisits Manila by Night,” an interview with actor Bernardo Bernardo, originally published in Ámauteurish! • Meta-interview: the source exchange with Bernardo Bernardo, conducted via Facebook Messenger. • “Film Plastics in Manila by Night” (August 2012), my contribution to the special issue on the film in Kritika Kultura. • “Primates in Paradise: Critical Possibilities of the Milieu Movie” (August 2011), a more theoretical consideration of the multicharacter format, in my first Kritika Kultura article. • “Thinking Straight: Queer Imaging in Lino Brocka’s Maynila (1975)” (August 2011), a reconsideration of Philippine cinema’s other major city film, in my first Plaridel article. • “Postcolonial Conundrum: Third-World Film in Perverse Perspective,” an attempt at commingling gender politics, film form, and history from below, in my last premillennial book Wages of Cinema (1990). • “Renewal of Appreciation,” a belated review written on the occasion of a retrospective screening in 1988. Sporadic exercises in production and performance, including the odd filmed interview. Awards & other occasions attended by an anti-awards advocate. More occasions, this time in print, where I got some light to shine on me. Exchanges with people whose expertise in their respective fields mattered. Recorded raw material that served as bases for my articles and reviews. People whose time with us made remembering them a matter of consequence. Public-domain materials, as far as I could confirm, that may also be as useful to others. Basic or raw materials I had gathered, written, or created. • Annual Filipino Film Chart (2016), an expanded and extended illustration from my dissertation (2002). • Film 297 (Special Topics) course titled Skinema, offered in 2009 at the University of the Philippines Film Institute’s graduate program. • The sequence breakdown of Gregorio Fernandez’s 1958 Malvarosa, an appendix from my dissertation (2002). • “The Reviewer Reviewed”: a reprint of a review of my second book, Fields of Vision, followed by my hasty and rather prickly response. 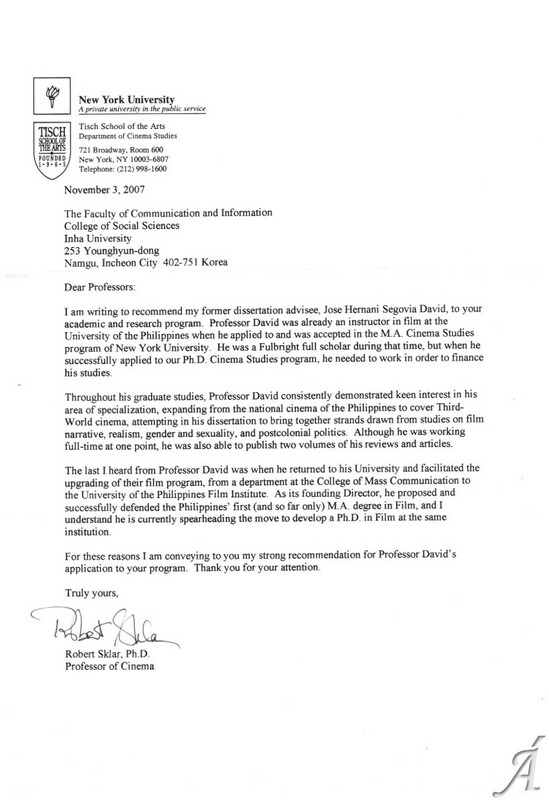 • “My Big Fat Critic Status” – draft of a letter I submitted to the Manunuri ng Pelikulang Pilipino (Filipino Film Critics Circle) in 1985, requesting for a less-active status, meaning non-participation in the annual awards exercise. • One more work not my own: a 2009 undergraduate research thesis (click here for PDF) by an advisee, whose background is even more fascinating than his choice of topic; uploaded with his permission. • To apply for my current teaching post in 2007, I had to solicit a recommendation from my dissertation adviser at New York University, so I requested Robert Sklar to provide one, available here. Four years later he died in a vehicular accident, before I could acquire tenure and thank him properly. During the winter break of 2013 when the university was deliberating my fitness for tenure, Ellen, my one true film-studies mentor, succumbed to colon cancer. • “Velasco’s Legacy,” a review of Johven Velasco’s Huwaran/Hulmahan Atbp., written in 2009 by filmmaker Jerrold Tarog. • On exchange at a Korean university, I taught feature writing to students for whom English was a (distant) second language. The goal was to make sure each member of the class could come up with an article. Necessarily this proceeded like a connect-the-dots exercise, with everyone going through the motions one step at a time. The university couldn’t believe the first batch had come up with a class folio, and showcased the results in a slim magazine format (PDF here). The next year’s batch included a couple of foreign students but only a posted, rather than printed, folio (PDF). • The (originally restricted) 1981 UNESCO Technical Report, prepared by Christopher Roads for the Marcos government, on “The Manila National Film Centre,” which provides insights on the origins of the building that would become the Manila Film Center, as well as the agency that would eventually be called the Experimental Cinema of the Philippines.